We are pleased to announce that Cordis Solutions is the winner of the SAPPHIRE Madrid Partner Innovation Award for their Duet Enterprise solution, myCompensation. Congratulations to everyone at Cordis Solutions for their tremendous work and dedication to developing a creative and impressive solution for your customer! The award was presented during the award ceremony at the SAPPHIRE Madrid Microsoft Booth on 14 November 2012. 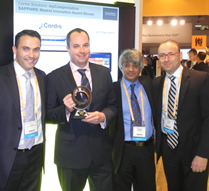 LONDON–(BUSINESS WIRE)–Cordis Solutions, a certified SAP® and Microsoft Partner, today announced it has received recognition for Innovating for Customer Success Award for myExpense application in 2012 SAP-MICROSOFT Unite Partner Innovation Awards.